Ministry and Internal Communications Made Simple! Now we can communicate in the church the same way we do outside of the church. I have never felt more informed or connected. I know more people now (in our church) than I have ever known before. I didn’t know that our church had so many ministries. I never knew that we had so many business owners in our church. Now we have an online directory of them. We can give online whenever we want. We (leadership) never knew the many occupational and spiritual gifts of our church members and now we have the ability to call on each member to assist us (occupationally and in their gifting). Our members are getting to know each other- matching faces and names and we are routinely celebrating our members’ birthdays. …our region has experienced severe inclement weather including…almost fifty (50) inches of snow falling in over fifteen separate snow falls. As a result, we have had numerous events cancelled and rescheduled – some on short notice. Having the ability to communicate rapidly…has been invaluable to us. Our leaders have sent more than 7,200 messages to all of our congregants. ..(And have) spent over 115 hours in video conferences and over 45 hours in audio conferences doing ministry and conducting church business. .. (This has) ..allowed our congregants …to meet without having to travel in ..dangerous and inclement ..weather conditions and has also reduced the need to travel to meetings so much. I was able to register for a church event by pressing a button on the app – too easy. I can access church documents online and download forms when I need to. As church secretary, this is the most user friendly tool that I have ever used and its made my life much easier. 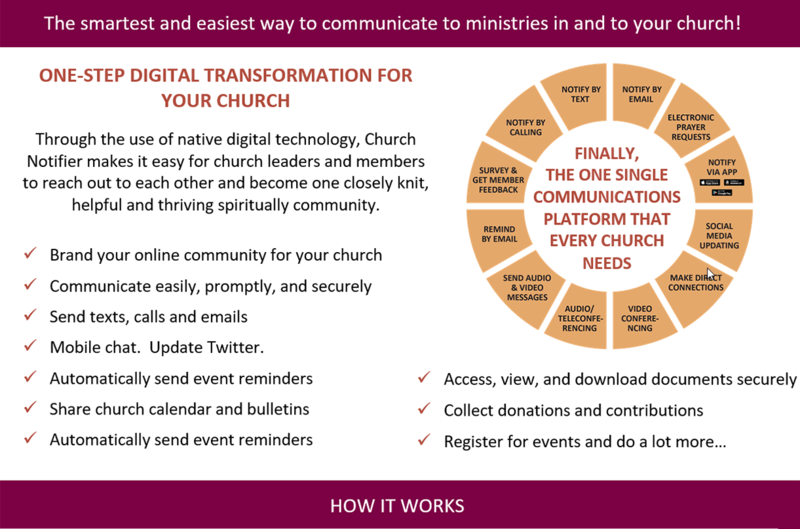 The system is user friendly and we strongly recommend the system to other churches for effective communication with your congregation. We offer the following plans to support churches of every size. Included with each package is a customer service representative who will advise and assist your church with implementation support during your first month of service. Thereafter, Church Notifier provides prompt technical and customer support to both church leadership and membership. We are always here to assist in the event help is required using our service. For a church demo or more information, please contact our Sales department. For customer service, please contact your service representative or our Customer Service department. For technical support, please contact your service representative or our Technical Support department. For information on partnering with us, please contact our Partnerships department. These are the number of sms messages delivered to your leaders or members per minute. UpStart sms messages are delivered 60 per minute, Growing sms messages are delivered 180 per minute, Established sms messages are delivered 360 per minute, Established Plus sms messages are delivered 1,200 per minute but can be increased to 30,000 per minute. This allows your leaders and members to call in to an 800 number and retrieve messages such as church closure because of weather or change of event time. The cost of this add-on is $4.00 per month and 1 credit per minute. You have the option of having a conference bridging 800 number that allows collaboration of leaders or members. The cost of this add-on is $4.00 per month and 1 credit per minute per conference user.  This is the initial number of voice credits you have that are used for incoming and outgoing voice calls and conference calling. Credits do not expire and you have the option of purchasing more at anytime. Outgoing calls and standard incoming calls are billed at 1 credit per minute. Inbound 800 numbers and Conference 800 numbers are billed at 1 credit per minute. This is the initial number of SMS credits you have that are used for outgoing and incoming SMS messages. Credits do not expire and you have the option of purchasing more at anytime. Outgoing and incoming SMS are billed at 1 credit per message. You are assigned a local number that allows your leaders and members to call in to retrieve messages such as church closure because of weather or change of event time. This is the maximum number of member registrants you are allowed to have in the system. Established+ accounts can increase this number over 550 for $0.20 per member. You have the option of adding document storage to your account for 6.00 per month per 10 GB.